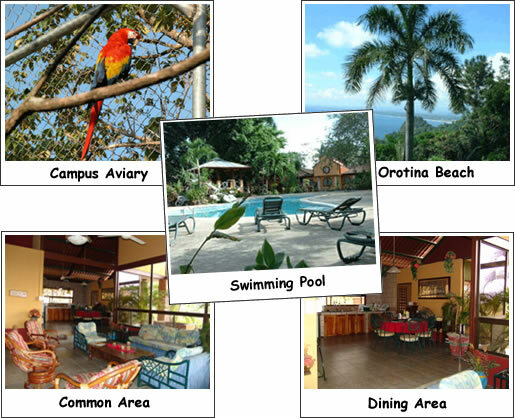 This Premier specialty boarding school for 17-21 year olds is located in tropical Costa Rica, just 20 minutes from the Pacific Coast beach. The setting is breathtaking, peaceful, and inspiring. Although only a brief flight away from many U. S. cities, the campus seems a world apart from the problems associated with the teens' former environment. The beautiful location along with a unique culture creates momentum for the imminent change that occurs in the lives of young adults here. In Costa Rica, youth may continue to earn credits for a high school diploma, work towards a GED, prepare for college, or take online courses for college credit. Bilingual teachers assist students in learning Spanish. All youth have at least one course in Spanish and an optional six-week Spanish Immersion experience is also available to assist them in acquiring language proficiency. Learning Spanish not only helps to meet high school and college requirements, but also builds confidence and self-esteem. Students’ experiences in Costa Rica are further enhanced when they develop language skills because they can participate in internships and vocational training in the local area. Vocational training includes but is not limited to ecology, oceanography, construction, maintenance, tourism, hotel/restaurant management, and horsemanship/breeding. In our quest to help troubled teens dream bigger and maximize their potential, we support and encourage them to prepare for higher education. As much as 60% of incoming freshmen drop out during their first year of college because they lack the characteristics that lead to success in college, such as self-discipline, initiative, dedication, proper study habits, time management skills, confidence, and motivation. We specifically target these areas and work to instill in youth these characteristics to help them overcome the challenges of the college experience. Youth become well-rounded by participating in a variety of activities on and around campus including community service, teaching ESL (English as a second language), weekly dances, cultural events, and a variety of recreational fitness activities. Some activities are contingent on positive behavior. Teens are also taught accountability and responsibility for their actions through a merit system where they are required to earn their status and privileges. As the youth expand their competence and achievements, they can begin to respect and love themselves again. This helps to increase their motivation and change their attitude and perspective on life. They also begin to discover a wider array of options for their future and begin to develop long-term goals and aspirations. Intertwined with these learning experiences are a series of experiential seminars that assist teens in recognizing their personal greatness and becoming the best version of themselves. Troubled teens learn about their true identity through an in-depth self-discovery process. They also gain valuable tools for facing present and future challenges and creating stronger relationships.